What Explains Attitudes toward the Individual Mandate? More adults support repealing the individual mandate than support keeping it, but nearly one-third are not sure whether the mandate should be kept or repealed. Opinions on keeping or repealing the mandate vary considerably by income, race/ethnicity, and educational attainment. Adults who support keeping the mandate recognize the value of pooling risk. Opposition to risk pooling is not a top reason for supporting repeal of the mandate. Repeal of the Affordable Care Act (ACA) individual mandate is now a provision of the tax reform bill before the Senate. The revenue gained by making this change would offset some of the revenue lost through cuts in corporate and individual tax rates, but the risk is that 13 million people could lose health insurance coverage over the next decade (CBO 2017). At the same time, the Senate is considering a bipartisan compromise, developed by Senators Lamar Alexander (R-TN) and Patty Murray (D-WA), that is designed to stabilize premiums in the nongroup health insurance market. This bill would fund cost-sharing reductions for health plans sold in the Marketplaces and give states greater flexibility in implementing the ACA. Repealing the individual mandate would rapidly undermine the market stability that the Alexander-Murray bill seeks to achieve. The individual mandate has been controversial since its inception. Although roughly half of Americans have a favorable opinion of the ACA and a large majority support the lawâ€™s financial assistance provisions and consumer protections, the requirement that people have health insurance or else pay a tax penalty remains unpopular (Karpman and Long 2017).1 This may be why repealing the mandate as part of tax reform is viewed as politically viable. But health policy experts agree that the mandate is needed to reduce adverse selection in the nongroup market. In this brief, we show that although the individual mandate is unpopular, only 4 in 10 adults support repealing it, and the remainder either support keeping it or are not sure what to do. 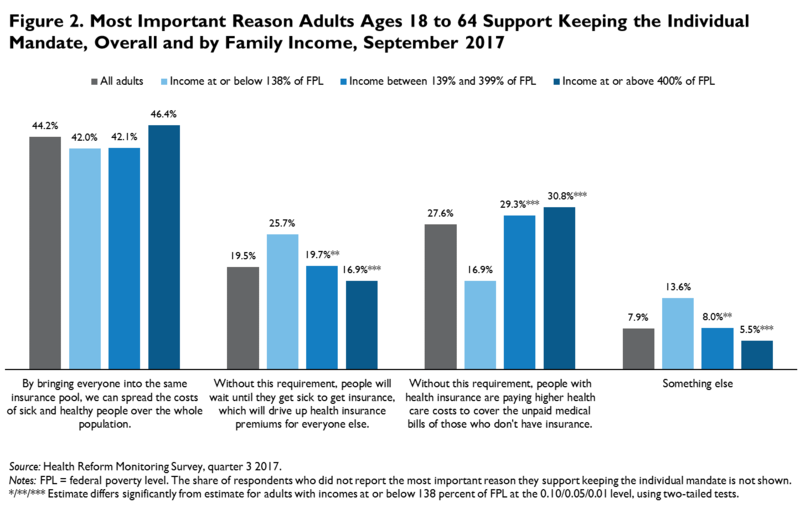 Support for repeal varies significantly by family income, race/ethnicity, and educational attainment, and it does not appear to be motivated by a belief that healthier people should not be in the same insurance pool with sicker people. We found that people who support repealing the mandate recognize the value of health insurance and overwhelmingly believe people should not be denied medical care simply because they cannot afford it. This suggests that these adults may be unaware of or opposed to the potential consequences of repeal. These findings are consistent with other recent surveys showing that support for repeal drops when people learn about the likely effects of eliminating the mandate (Kirzinger et al. 2017). We used data from nearly 9,500 nonelderly adults who participated in the September 2017 Health Reform Monitoring Survey (HRMS) to analyze support and opposition to the individual mandate. Seventy-five percent of respondents were randomly assigned to receive a question asking whether they would like to see the individual mandate kept or repealed; respondents also had the option to report that they were not sure. The remaining 25 percent of adults in the sample were not asked this question. Adults were then asked to select the most important reason they would like to see the mandate kept or repealed. We found that adults favored repealing the mandate over keeping it by a margin of 39.3 percent to 29.6 percent (figure 1); an additional 30.5 percent were not sure whether the mandate should be kept or eliminated. In other words, when given the option to report that they are unsure, only a minority of Americans definitively support repeal. Adults in each age group were more likely to support repealing the mandate than keeping it (table 1), and the difference was particularly striking among older nonelderly populations (45.5 percent versus 29.8 percent).3 Both men and women were more likely to support repeal. Adults with low and middle incomes were far more likely to support repealing the mandate than keeping it, perhaps because the mandate penalties constitute a greater financial burden for them relative to their incomes. For example, adults with incomes between 138 percent and 400 percent of the federal poverty level (FPL) favored repeal by a margin of 44.5 percent to 25.0 percent. Those with incomes at or above 400 percent of FPL were equally split between repealing and keeping the mandate (40.5 percent to 39.2 percent). Source: Health Reform Monitoring Survey, quarter 3 2017. Notes: Estimates do not sum to 100 percent because the shares of respondents who were not sure or did not report whether they support keeping or repealing the mandate are not shown. */**/*** Estimate differs significantly from estimate for reference group, denoted by ^, at the 0.10/0.05/.01 level, using two-tailed tests. +/++/+++ Share who support keeping the mandate differs significantly from share who support repealing the mandate at the 0.10/0.05/0.01 level, using two-tailed tests. There were important differences by race and ethnicity. Non-Hispanic white adults were more likely to support repealing the individual mandate than to support keeping it (48.1 percent to 26.3 percent). Non-Hispanic nonwhite adults were far more likely to support keeping the individual mandate (41.4 percent to 20.5 percent), and there was no statistically significant difference among Hispanic adults. These differences across racial and ethnic groups did not vary by income or education (not shown); for example, low-income non-Hispanic white adults also supported repeal, and low-income non-Hispanic nonwhite adults supported keeping the mandate. Adults with a high school diploma or less education and those with some college education were far more likely to support repealing the mandate. In stark contrast, adults with college degrees favored keeping the mandate over repealing it (44.6 percent to 36.3 percent). There were significant differences by political party affiliation. Those who reported being Republicans or leaning Republican were far more likely to support repealing the mandate (65.5 percent versus 11.4 percent). Conversely, those who reported being Democrats or leaning Democratic were more likely to support keeping the individual mandate by a margin of 44.8 percent to 20.3 percent. Within all subgroups, many respondents were not sure whether they supported keeping or repealing the mandate. Those most likely to report that they were not sure were young, female, nonwhite or Hispanic, lower-income, less educated, and unaffiliated with a political party (data not shown). Among those who wanted to keep the individual mandate, the main reason (44.2 percent) was that bringing everyone into the same risk pool would spread the costs of the sick and healthy over the entire population (figure 2). Across all incomes, this was the dominant reason for keeping the individual mandate. 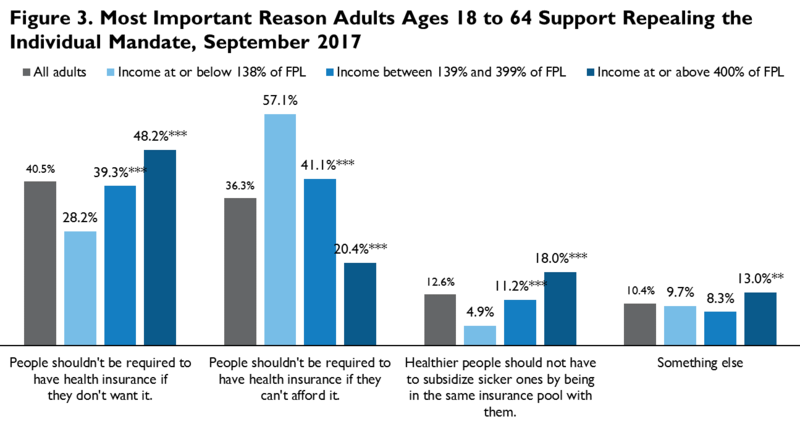 Adults with incomes at or below 138 percent of FPL were more likely than those with incomes above 400 percent of FPL to report that the most important reason was that without a mandate, people would wait until they got sick to get health insurance, driving up premiums for everyone else. Higher-income people were more likely than lower-income people (30.8 percent versus 16.9 percent) to report that the most important reason for keeping the mandate was that without the mandate, people with health insurance would pay higher health care costs to cover the medical bills not paid by those without health insurance. We found that among those who supported repealing the individual mandate, only 12.6 percent reported that the main reason for repeal was that healthier people should not have to subsidize sicker people by being in the same insurance pool with them (figure 3). Instead, 40.5 percent reported that their main reason for supporting repeal is that people should not be required to have health insurance if they do not want it; another 36.3 percent reported the main reason that people should not be required to have health insurance if they cannot afford it. The reasons given varied by income. 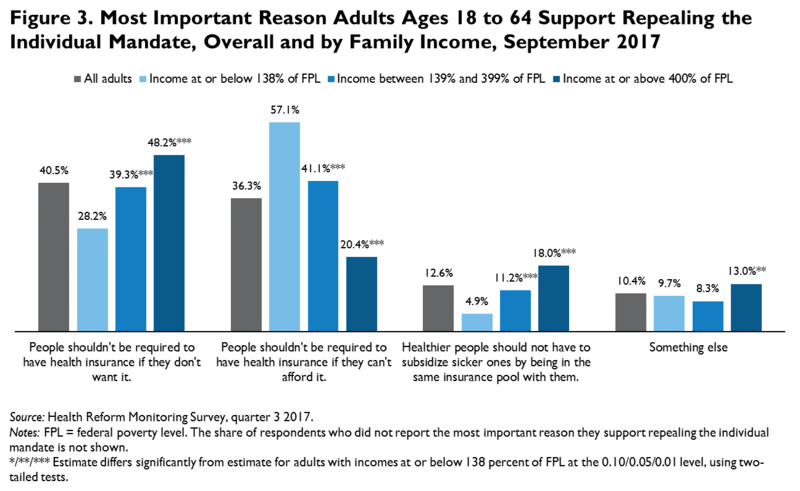 Adults with incomes at or above 400 percent of FPL were more likely than low-income adults to state that the main reason for repeal is that people should not have to have health insurance if they do not want it, and less likely to report the main reason that people should not be required to have health insurance if they canâ€™t afford it. Adults who support repealing the mandate acknowledge the importance of having health insurance. Among those who supported repealing the law, a large majority recognized the importance of health insurance (table 2). Of those supporting repeal, 61.2 percent disagreed with the statement that healthy people do not need health insurance, and 81.4 percent agreed that even healthy people are at risk of sudden injury or illness and thus need health insurance. More than three-quarters (76.1 percent) believe that people should not be denied medical care because they cannot afford it, and 90.1 percent believe that health insurance should protect families from the cost of unexpected medical emergencies. Support for these statements was higher among people who supported keeping the mandate. But even those who support repeal recognize the importance of health insurance; they reject the idea that the government should require it and enforce that requirement with a tax penalty. Notes: Half the sample was randomly assigned to each statement and asked if they agree or disagree. Shares of respondents who did not report whether they agree or disagree with each statement are not shown. */**/*** Estimate differs significantly from estimate for adults who support keeping the individual mandate at the 0.10/0.05/0.01 levels, using two-tailed tests. 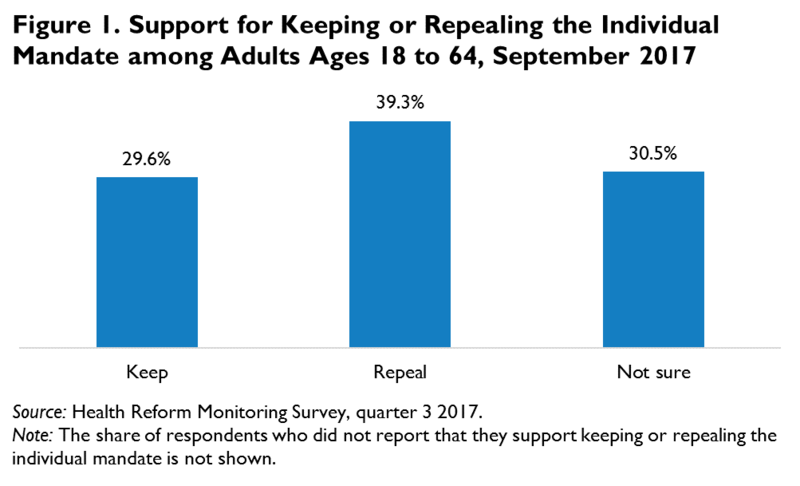 The September 2017 HRMS data show that more people support repealing the individual mandate than support keeping it, but almost one-third are not sure whether it should be kept or repealed. We found the strongest support for repeal among adults who are older, non-Hispanic white, lower-income, less educated, and Republican. People seem to support repeal because they object to the government requirement in general or because they object to the requirement to purchase an unaffordable product, not because they object to spreading the risk of high health care costs across the population. But even those who support repeal seem to believe in the importance of health insuranceâ€”that even healthy people need insurance and that people should not be denied medical care because they cannot afford it. People who support keeping the individual mandate overwhelmingly agreed that having everyone in the same risk pool reduces costs for sick people and others purchasing insurance, and that premiums would be higher without a mandate. There is an apparent contradiction in the strong support for repeal of the individual mandate and widespread recognition of the importance of health insurance. Most Americans want everyone to have access to health care, but private insurance cannot be made available to all without a mandate or very strong incentives to obtain coverage. Many of those who support repeal may not have reckoned with all of its consequences: if people could choose to purchase health insurance when they wanted or needed it, premiums would be higher, more people would be uninsured, risk pools could be unstable, and fewer insurers would be willing to participate in the nongroup market. CBO (Congressional Budget Office). 2017. Repealing the Individual Health Insurance Mandate: An Updated Estimate. Washington, DC: CBO. Karpman, Michael, and Sharon K. Long. 2017. “Adults Who Would Be Most Affected by ACA Repeal Support Keeping Core ACA Provisions.” Washington, DC: Urban Institute. Kirzinger, Ashley, Bianca DiJulio, Cailey MuÃ±ana, and Mollyann Brodie. 2017. “Kaiser Health Tracking Poll - November 2017: The Role of Health Care in the Republican Tax Plan.” Menlo Park, CA: Kaiser Family Foundation. NPR, Kaiser Family Foundation, and Harvard School of Public Health. 2008. “The Public on Requiring Individuals to Have Health Insurance â€“ Toplines.” Menlo Park, CA: Kaiser Family Foundation. John Holahan is an Institute fellow, Michael Karpman is a research associate, and Stephen Zuckerman is a codirector and senior fellow in the Urban Instituteâ€™s Health Policy Center. The authors gratefully acknowledge the suggestions and assistance of Linda Blumberg.